To stay alive, human beings need air, food and water. If you are college student, add to this list of vital resources Internet access. That’s right, college students surveyed think the Internet is just as important as eating and drinking, and given a choice between a car (64 percent) and dating (40 percent), would choose connectivity. This is just a microcosm of the next-gen expectations placed on the IT pros and their data centers at higher education institutions today, which also must serve faculty, researchers, operations and admin staff and sports fans across the campus and beyond. To do so they are turning to edge solutions. A connected college experience for students begins with prospecting and goes on to processing. For example, a benchmarking industry report from Ruffalo Noel Levitz, shows that 77 percent of spring high school juniors and 82 percent of fall seniors use an institution’s website as their top planning resource. The majority of seniors (71 percent) and juniors (65 percent), complete enrollment-related forms on their mobile devices. In terms of learning, according to survey from McGraw-Hill, four out of five college students find digital learning technology to be helpful in improving their grades, and more than two-thirds believe it helps them focus. Adaptive learning technology and online quizzes are seen to be the most impactful, with half of students who have used them reporting that they have a “major effect” on their grades. Of course, professors are also heavily involved on the other side creating a wide-range of digital learning programs to meet the expectations of students. Additionally, researchers expect the latest capabilities in their labs, continuity is critical to campus safety and packed stadiums call for huge bandwidth. How can IT support all these connectivity priorities and ensure the entire campus and beyond stays running? Just like in the enterprise, universities and colleges are using a combination of conventional data centers, distributed environments and new edge solutions to create a next-gen architecture that meets next-gen learning and demand. Typically, the core data center is still a separate facility run by centralized IT, and other facilities like dorms, libraries and labs will have their own wiring closets. These used to be a server and networking equipment, but now have to become mini data centers in their own right because of the demand for processing power and connectivity. 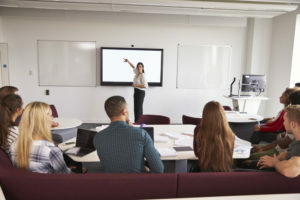 To that end, many higher education institutions face aging infrastructure and are in the process of modernization by adding more edge solutions. They must do so in order to effectively recruit (and keep) both students and academics. Edge computing meets the high demands of the connected campus today by bringing bandwidth-intensive content and latency-sensitive applications closer to the user or data source.